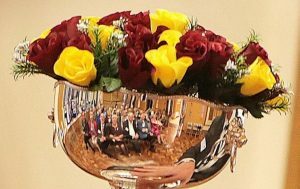 The Reunion Rosebowl was presented to the school by Graham Dunigan (FP 1962) at the 95th anniversary dinner held on 19 June 2015. The Rosebowl has been presented to the school to encourage all FPs to hold a reunion and the dates thereof are engraved on it to mark the occasion. It is displayed at each formal reunion event. The school’s facilities are available to for reunions and other events. Please contact the Depute Bursar.